Based on the manga series Umimachi Diaries by Akimi Yoshida, Our Little Sister is the story of three women who learn about the death of their father as well as the realization that they have a fourteen-year old half-sister who has no one to take care of her. Written for the screen, edited, and directed by Hirokazu Koreeda, the film is an exploration of sisterhood and family where three women deal with the estrangement and loss of their father as well as the new person in their life. Starring Haruka Ayase, Masami Nagasawa, Suzu Hirose, and Kaho. Our Little Sister is a ravishing and evocative film from Hirokazu Koreeda. Set mainly in the seaside city of Kamamura, the film revolves around three women who take in their fourteen-year old half-sister following the death of their estranged father as they all deal with his loss but also the things that led to the estrangement and other issues revolving around them. It’s a film with a simple premise that explores four women who share the same father but one of them has a different mother as they all deal with living together in their grandmother’s home as well as other things in their lives. Hirokazu Koreeda’s screenplay doesn’t really go for any kind of traditional narrative structure as it’s more about the building of a relationship between these three women and their newly-discovered half-sister whom they invite to live with them. The eldest in Sachi Koda (Haruka Ayase) is a woman works at a hospital as a nurse as she is the most maternal of the three as she had helped raise her two younger sisters since their father left them for another woman and their mother would suddenly abandon them after the fallout of the affair. The other two sisters in the banker Yoshino (Masami Nagasawa) and the 21-year old shoe store clerk Chika (Kaho) are also trying to live their lives and go through some form of growing pains as they would take in their 14-year old half-sister Suzu Asano (Suzu Hirose) as they knew about her for a while but never really got to know her. 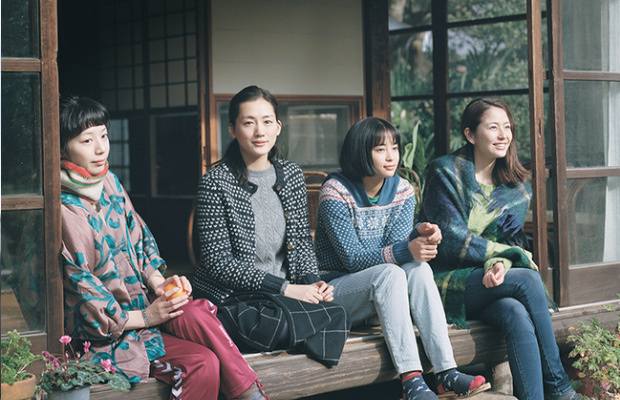 Much of the film is about these four women living together in this small town as they introduce Suzu to this very warm and lively community of people that includes a diner owner they’ve known since they were kids as well as a regular customer of that diner and their great aunt who is a little hesitant about meeting Suzu. Yet, Suzu would eventually fit in with her new surroundings as she also becomes close to her older sisters as it would play into the development of all four women. Especially as Sachi is having an affair with a married colleague while Yoshino’s life of being with men who aren’t good would finally take its toll. Koreeda’s direction also takes a very simple approach to the story as it is largely shot on location in Kamamura as the town itself is a character in the film. While Koreeda would use some wide shots to establish much of the film’s locations as well as some scenes around the house of the four sisters. He would favor something that is more intimate as it is the right tone of the film where Koreeda doesn’t really go for anything stylistic other than in the compositions which definitely captures a lot of depth in the image. Especially with the medium and some of the wide shots in capturing the four sisters in a single frame as there aren’t many close-ups in the film so that Koreeda can focus on the four sisters together or individually. There are moments of humor but it’s mostly subtle as is some of the drama where it is very restrained as Koreeda is more about building up the relationship between Suzu and her three older sisters. Notably in these little moments where there’s a reveal about Suzu’s relationship with her father as it raises question about what her sisters missed out on. Koreeda would also create little subplots in the film that help add to the development whether it’s Chika watching over Suzu with a friend or Yoshino trying to help the diner owner with her finances. It all has something that does feel natural as it’s also Koreeda would create these scenes and dramatic moments very patiently which includes a key meeting between the three sisters and their mother during a memorial service for their late grandmother. There is a sense of tension that is looming but Koreeda chooses not to go overboard as he knows where to hit the right notes. Also serving as the film’s editor, Koreeda would maintain that simplicity as he only uses a few fade-outs for transitional reasons where it is about these sisters bonding as it would include moments that are very touching without the need to be overly sentimental as Koreeda knows where to hit the right notes. Overall, Koreeda creates an intoxicating and rapturous film about three women bonding with their newly-discovered half-sister. Cinematographer Mikiya Takimoto does excellent work with the film’s very naturalistic yet colorful cinematography as it doesn’t aim for any kind of particular style but rather something very straightforward including some of the scenes set at night. Production designer Keiko Mitsumatsu, with set decorator Ayako Matsuo and art director Mami Kagamoto, does brilliant work with the design of the home the sisters live in as well as the interiors of the local diner they go to as well as some places in the city. Costume designer Sachiko Ito does nice work with the costumes as it is very straightforward as the clothes play to the personality of the characters along with the robes they wear for a local ceremony in the summer. Sound mixer Yukata Tsurumaki does wonderful work with the sound as it also presented in a very simple manner to play into the atmosphere at the house and areas in the city. The film’s music by Yoko Kanno is incredible for its usage of sumptuous string arrangements that is very low-key but very effective as it help sets a tone for the drama without overdoing the scene or the moment. The casting by Toshie Tabata is fantastic as it feature some notable small roles from Kirin Kiki as great-aunt Fumiyo, Lily Franky as the diner owner Sen-ichi, Jun Fubuki as the estranged mother, Shinichi Tsutsumi as a diner regular who knew their father, and Ryo Kase as a colleague of Yoshino who would help her settle financial matters for Sen-ichi. The performances of Suzu Hirose, Kaho, Masami Nagasawa, and Haruka Ayase are phenomenal in their respective roles as Suzu, Chika, Yoshino, and Sachi. Hirose’s performance as Suzu is a joy to watch as a 14-year old coming of age as she exudes an air of innocence into her performance while Kaho’s role as Chika is full of energy and wit as someone who is young but also responsible as she is very excited about being an older sister for Suzu. Nagasawa’s performance as Yoshino is fun to watch as someone who goes from being a typical mid-20s woman who likes to have fun and sleep around to being responsible as she does whatever she can to help out a family friend. Ayase’s performance of Sachi is definitely the most reserved as the eldest of the four sisters as she is also the most maternal as she acts as a mother figure to Suzu while also be very flawed in her own situations. The four women together have this potent chemistry that is just incredible to watch as it feels like they are sisters as they fight, laugh, and cry together as they are a major highlight of the film. Our Little Sister is a tremendous film from Hirokazu Koreeda. Featuring a remarkable ensemble cast as well as a very simplistic yet engrossing story that is carried with gorgeous images and its location. It’s a film that manages to provide so much by doing so little as it prove that even something ordinary like a story about sisters can be extraordinary and more. In the end, Our Little Sister is a magnificent film from Hirokazu Koreeda.